This weekend's report on reasonable value stocks that increased dividends in the last week included two stocks. 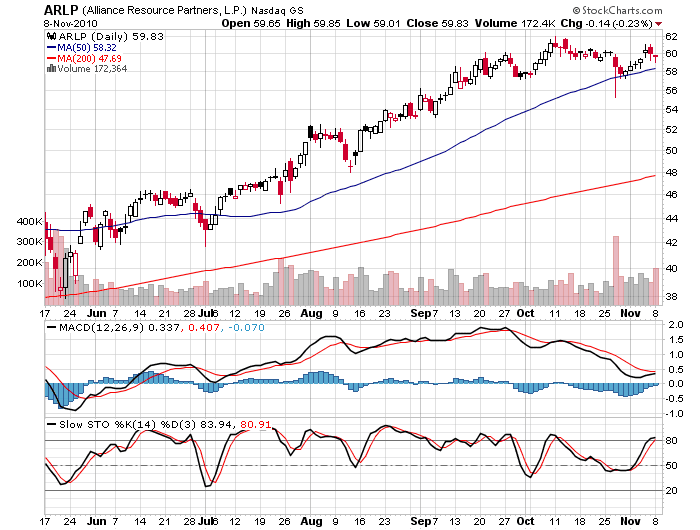 The one I'd like to focus on is Alliance Resource Partners, L.P. The symbol is ARLP. 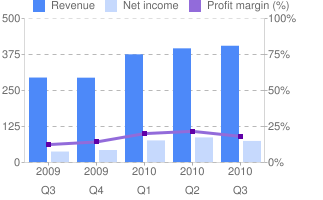 The company just raised its dividend from $3.24 to $3.32 which works out to a forward annual dividend rate of 5.5% which, in these days of zero interest rate policy, is not too shabby. As the title of this post suggests, the company is engaged in the production and marketing of coal for utilities and industrial users. They also provide systems and services for the mining and transportation of coal. I alluded to the fact that the company qualifies as one of my "reasonable value" stocks. With a PE of 8, a PEG less than 1, Enterprise Value/EBITDA less than 6, Price-to-Sales less than the average for both the sector and the S&P 500, the stock certainly can't be considered particularly over-priced. You can see the mixed signals on this chart. While the stock consolidates, MACD has been in decline. Slow Stochastics also seem to trending lower though there has been a recent spike upward. The most promising technical feature is that the 50-DMA seems to be providing good support. Note as well that the stock has roughly tripled over the last two years so it is not unreasonable for it to take a breather at this point. The fundamentals for coal are primarily driven by economic activity. As a result, the growth in the U.S. economy, painful as it may be, is leading to increased demand for electricity. This should support pricing as demand from utilities should remain firm. Furthermore, foreign markets are also showing demand for coal for both steel making and utilities. Another positive factor is that there is now a perception that, with Republicans in the ascendancy, regulations may be easing on coal-fired utilities. The assumption then is that coal will remain a primary fuel for power generation and that alternate energy sources may see less of a push from the government. 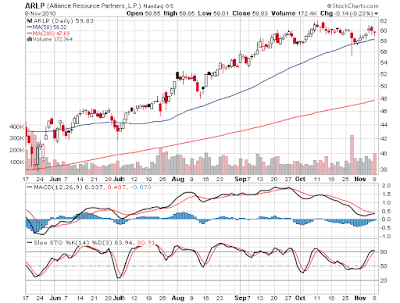 So as Alliance Resources flirts with its 50-day moving average, the stock may actually be providing a decent entry point. Keeping in mind that the company is still fairly cheap, a failure to break below the 50-DMA would be reassuring, indeed.